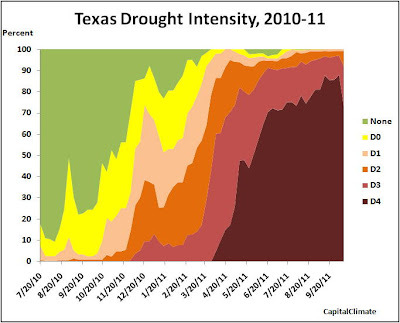 Long-awaited precipitation in the past week has put the first significant dent in the ongoing Texas extreme drought conditions, but 92% of the state remains in the extreme (D3) or exceptional (D4) category. Exceptional drought, the highest category, has dropped from the peak of 88% of the state last week to 73% currently. The current drought outlook, released October 6, shows drought persisting through the end of the year in most of Texas, with the exception of some improvement in the panhandle region and adjacent areas of Oklahoma. The outlook was published before the heavy rains of the past weekend, however. I worked with TransCanada before on another pipeline. And I have never had a company like them that took care of environmental issues like they have. They really care about the environment. This would be the same Jason Berringer who was spotted in a paid pro-pipeline ad on a commercial cable news network within an hour or so of the PBS broadcast. A few days into the demonstrations, the State Department released the final environmental impact statement on the project, a study three years in the making. It says the pipeline would carry a blend of synthetic crude oil and diluted bitumen and poses no significant impact to the environment. In a classic example of false equivalence, the feckless reporter concludes, "Both sides accuse each other of playing fast and loose with the truth."